Offering you a complete choice of products which include pipe conveyor belts. FORECH-HILTON is the Brand for a group of Companies, focused on meeting the needs of the Mining & Mineral Processing and Construction Industry related to bulk material handling wear protection servicing and maintaining conveyor belt systems and environmental management. The Company now has almost four decades of experience servicing these industries. The Group started its activities in the year 1972 with the initial focus on Conveyor Belts. Gradually, With the induction of new technologies and systems its activities have grown, to cover the rubber based needs of the above industry segment speciﬁcally in Crushing, Screening & Material Handling area. 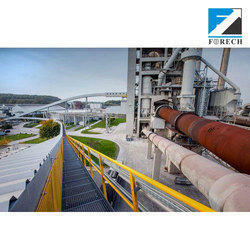 FORECH-HILTON Conveyor Belts are produced at two locations of the company, with a production capacity of 18000 tons/annum. Our products include a comprehensive range of Conveyor Belts, Rubber Lining materials both for Wear and Chemical Resistance, composites made of Metals, Ceramics, Textiles and Rubbers, Repairs and Splicing materials required for the above industrial segment. The continuous growth which FORECH-HILTON has shown in the past is a result of efﬁcient production processes and keeping a close contact with all the areas where these products are being used. Today the group exports its products to over 50 countries around the world, which constitute to almost 55% of its turnover and endeavors to become a one-stop-shop to meet all the rubber related needs of the mining and mineral processing industry. The group holds its prominent position in this ﬁeld on account of a constant search for improvement and further development based on customer needs and responses. In search of excellence the group has also been assisted by global brand leaders in their respective ﬁelds of Conveyor Belts, Wear Resistant Components, Rubber Sheeting, Repair and Splicing Systems. The environment is adequately protected against the toxic hazards of pollution. The material being carried is protected against rain, dust abnormal temperature fluctuations, and wind. The wastage and spillage are greatly eliminated resulting in lower maintenance and operating costs. The levels of noise emission are reduced. The total length of the conveyor is significantly reduced by elimination of transfer points in a narrow terrain and the combination of multiple conveyors to one. The belt can negotiate vertical, horizontal and 3 - dimensional curves with sharp radii. The structural cost is greatly reduced by eliminating the canopy on top of the conveyor structure. The material can be conveyed at inclinations up to 35º without carrying back. The constraint of space is overcome to a great extent. The Pipe Conveyor Belt, during the last decade, has revolutionized the way bulk materials that are handled and transported, by adopting an Enclosed Material Transfer Principle. With an overriding stress on maintaining a clean environment and the need for higher ﬂexibility in routing in arduous and difﬁcult terrains, the solution lies in carrying the material by Pipe conveyor Belts.The Pipe Conveyor Belt assumes the shape of a normal troughed belt during its loading and discharge points but assumes an enclosed proﬁle in the shape of a pipe during its forward and return runs. With the aid of specially designed idler system, the belt is transformed from a troughed proﬁle to a pipe proﬁle and vice versa. Forest makes pipe conveyor belts are most innovative in its design which ensures the optimal performance and reliability protecting the environment from the deleterious effects of noxious pollutants, is cost effective and has the lowest operating cost for per tonne of material handled.